Is this a new sculpt? NYCC was pretty light with regard to The Clone Wars figures. That makes me think that Hasbro held a lot of product back for Toy Fair in February. Maybe? Yep. The hair is definitely different from the most recent release, and the face seems to have an angry expression. That makes me think that Hasbro held a lot of product back for Toy Fair in February. Maybe? Probably. I'm sure they want to focus to be on their push for the 3D movie release right now. and speaking of clones...I am really digging the phase 2 armor. I don't feel compelled to buy every version, either. But I want the best one, which usually means that I end up buying every one. ...and speaking of clones...I am really digging the phase 2 armor. I like it, too. But the picture of the upcoming Rex action figure worries me. It looks like he's got some serious buckethead going on there. Sheesh, that helmet looks HUGE! 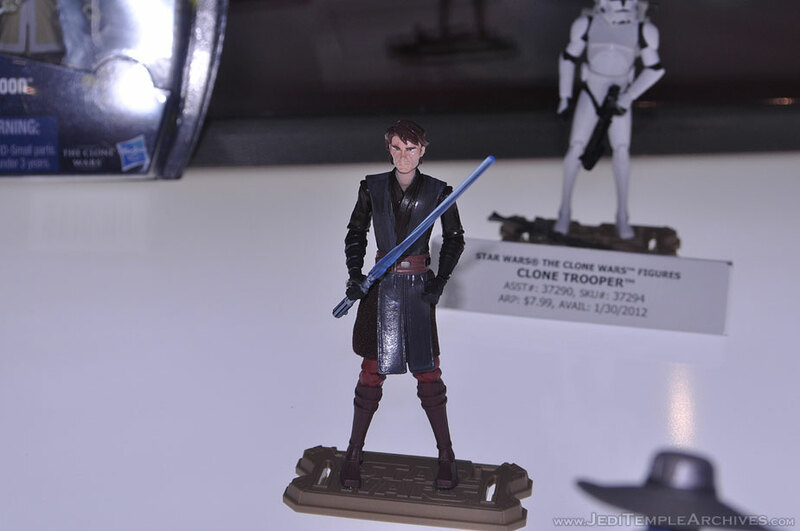 It looks like new sculpts for both Anakin and Obiwan to me...how many variations of these guys do they really expect us to purchase? I don't know that Hasbro expects collectors to keep buying new versions so much as they want to keep fresh takes on the characters in stores for kids. I mean, they're not stupid. They know there are some collectors who will buy whatever they release, even if it's just in a slightly new package. Kids/parents make up the bulk of this line's market, though. I'm happy with the season 3 versions of Anakin and Obi-Wan we already have, but like Kit, I could be compelled to buy updates if I love them when I see them. I don't know that Hasbro expects collectors to keep buying new versions so much as they want to keep fresh takes on the characters in stores for kids. I mean, they're not stupid. They know there are some collectors who will buy whatever they release, even if it's just in a slightly new package. Kids/parents make up the bulk of this line's market, though. I agree. I remember the time that I was in TRU, looking for new Star Wars figures. There was a mother in front of me, sifting through the figures on the pegs. She noticed me standing a couple of feet away, also looking at the figures (I was waiting my turn). She looked at me and said, "Do you collect these figures?" I said, "Yes." She then said, "I'm just looking for a Darth Vader figure for my son." I pointed to the Anakin Skywalker figure which was packaged as "Darth Vader" (Saga Legends, I believe). She looked at me and said, "No, you know, Darth Vader." I then told her to keep an eye out, because Hasbro periodically re-releases Darth Vader as he appeared in the original trilogy. My point? Parents and kids make up a huge portion of the market for these toys; and Hasbro is wise to keep the core characters in a constant rotation. Absolutely. They account for the majority of the market, which is why The Clone Wars is a much bigger seller than TVC. On the other hand, the lack of children interested in G.I. JOE is why the brand only gets a few pegs of space per store. The average collector is buying more toys than the average kid, but the amount of kids who play with action figures vastly outnumbers the amount of adult collectors. "Live to fight another day, boys!" I agree. My figures of Kix and Jesse need their comrade-in-arms! I can't wait for this pack. "5. 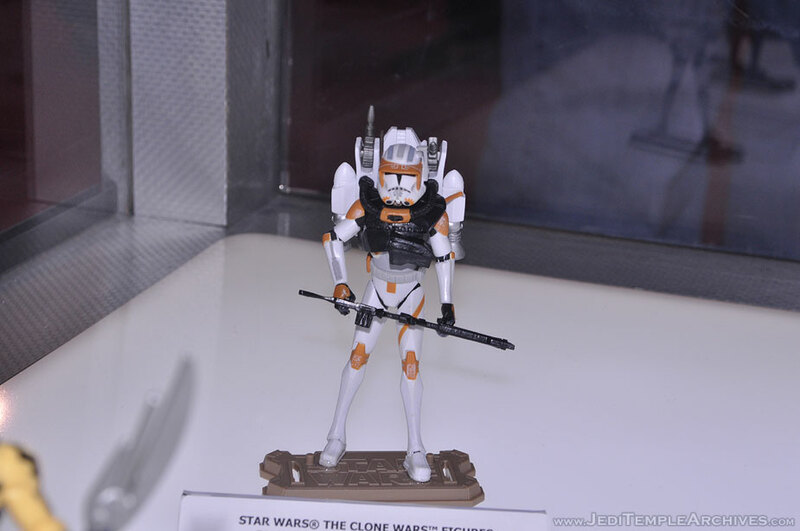 What is up with Hasbro's plans for the Clone Wars line in 2012. A total of 19 carded figures for the entire year (as stated at NYCC and reiterated in this month's Q & A) has me perplexed. It seems like a good way to damage a line that has seemed quite successful. Any insight into what is happening? In 2010 we got a number of new figures, but it was still basically only in the 20s for carded figures. Some years are better than others and the release schedule for The Clone Wars is highly unusual-- most years seem to have a massive release around August, with 1 or 2 or 3 other waves throughout the year. Hasbro hasn't been doing much in the way of a steady flow of new product, so it's possible people simply aren't looking and if that's the case, it isn't worth Hasbro's time to invest in more new product when the old stuff is, in some areas, doing just fine. So for now, 19 seems like not much-- but it also depends on what that means for the whole year and that we don't know. If Hasbro does 19 new molds, that sounds pretty slow-- like 1980s slow. With 19 figures, it's my sincere hope that we'll see many more figures cycled in and out, because there are a fair amount of older figures needing another shot at retail like Aayla Secura, Commander Bly, the ARC Troopers from the 2010 Battle Pack, the TX droids, and so on. Really, Hasbro could do a pretty solid year just playing catch-up and we're seeing a tiny bit of that now with a much-delayed and welcome new run of Hondo Ohnaka. Seeing more Darth Sidious would be good, particularly since we're in a Phantom Menace year. So yeah, 19 new figures-- I can't imagine it'll be 19 in total, because after the line relaunches, that means the old stuff will probably be flushed out of the retail system somewhat quickly and they would need new product (old figures in new packaging) to have something to sell. But that's just a hunch, we won't know for sure until cases show up or Hasbro flat-out explains it. But 19 figures in total? I just can't fathom it being that small, unless the emphasis on new product in the other two lines grows significantly. (After all, Movie Heroes is going to have new products, and Saga Legends-- the line it's replacing-- rarely had more than a few repaints, if that, in a year.)"